Where can I go with my mad thoughts? This was the utterance from a lady running hundreds of operational staff in a large firm. She had the typical back-to-back diary of most leaders. She had the conflictual pressures of cost-out and staff engagement up, and she had the moving goal-posts common to organisations in flux. She arrived into her supervised learning pod with that question. She went on to describe her case of leadership practice effusively prefaced with the idea that right now she wanted to sack her whole team. This was a "mad thought". She knew of course that it was an impractical approach, but she and her colleagues enjoyed the delicious moment of fantasy that it might be possible. This is why colleagues convening dialogue about their ongoing practice of leadership is fruitful because it is a place where our mad thoughts are welcome and can be safely expressed. We talk together to allow our thoughts to die so we don't have to. Being able to bat about an absurd idea of "sacking the lot of them" is its own therapy. Somewhere in that narrative is a kernel of truth and no doubt plenty that the leader has co-created and provided themselves. The group is able to enjoy the momentary fantasy of "scorched earth restructure" (as one colourfully described it) before graduating to a more practical exchange about where the team is getting stuck and what she might do to help things along and help herself. Have you got somewhere to go with your mad thoughts? If not, convene some colleagues together, no agenda, just a time window, say 45 minutes, and explore your practice of leadership, together. Think about it together. Play with each others mad thoughts. Together. What behaviour do you allow in your meetings? We will resist the "too many meetings" rant found elsewhere. Leadership is social, leadership is dialogue - and that takes the form of meetings. Meetings are the job, not something alongside the job. And why does meeting quality suffer? One reason we hear in leadership cases is the group tolerating bad behaviour from individuals in the meeting. This might be laptops open and email being done, or a sour scowl etched on the face of a participant throughout the dialogue and no one calling attention to it. The skill for the leader then is to call attention to the present. Most meetings are paying attention to the past (the results) and the future (the plans). This is strangely soothing because it doesn't need us to do anything at all - the past is done, and the future is uncertain and may prove to be beyond our control. But the present - that is anxiety-invoking because we might direct energy and attention to behaviour on display in the here and now. And if you think data is only on your spreadsheets and slides think again. Data is all over the faces and bodies of everyone present. As you meet, work with your head up to take stock of what your colleagues are throwing off as information by dint of their reaction to what is being said. Recently we had one group member radiate "hostage" during a session; we had another staying on their iPad email throughout the group discussion; and we had another arms-crossed body-tilted away from the discussion. The group all noticed and in each case did not know how to approach it. In each of these separate instances we invited the group to call attention to anything they think is taking the group away from its primary task, and in each case one individual was able to speak to the errant behaviour on display. Exploratory yet challenging conversation was had. And the group became more effective for the effort expended. Not easy, just useful. 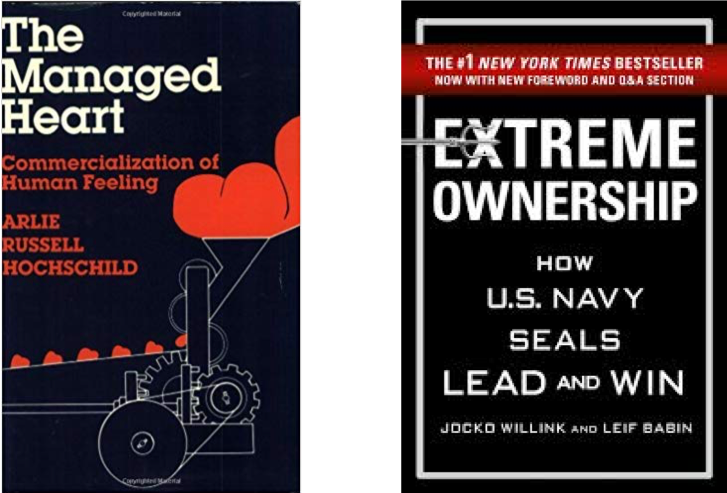 Where we contrast a book that speaks to the dominant or mainstream way of thinking about leadership and management with another book written in a different scholarly tradition. We hope the contrast forges a crack in established thinking and lets new light through. Smile like you really mean it! That's what Delta airline stewardesses being trained by pilots were told. That was in the 1980s. Sociologist Arlie Hochschild coined a term and struck a nerve when she described this work as "emotional labour". Her idea is that workers are asked to not just do certain things, but to feel certain things as well. Her contention is that this creates a clash between the genuine emotion resident in the worker and the confected one he or she is compelled to put forth. Over time this effort is fatiguing. Worse, these workers were often told to display these emotions "authentically". The book is a useful read for today's leader as so many are being asked to foster cultures of energy, fun, and a great place to work. These are noble ambitions, but do call on leaders to enact a sub-set of emotions that are preferred. For leaders of call centres, sales teams, help desks and other cohorts of take-care-of-people roles, the book might offer a way to talk about the fatigue of confected emotions and give those teams a way to express genuinely how they are experiencing their work. This is from the popular military-to-business metaphor. It is described as 75% a war memoir, 25% a "be a better leader" manual. It has a persistent idea - that a leader should take full responsibility for everything that goes wrong. Do not shift blame, do not blame the situation or the others. Just own all of it and good things will happen. The authors tell a series of Iraq stories (fascinating to read) and then stitch them to organisational life which is more tenuous. The actions of a sniper in a theatre of war are somewhat at odds with the remit offered most organisational leaders. This book has the quality of "compelling vapour" like many in the genre, an interesting read (about wartime life) packaged as a text for leaders that once settled leaves little behind. Depending on your appetite for tales from theatres of war you will enjoy this book or not, but if you use it as vehicle to convey leadership wisdom (it was a text in one client's leadership program imported from the US head office) you risk the unintended consequence of the soldier metaphor being taken too far. You also risk alienating those less comfortable with war being a proxy for work life. SALES PROFESSIONALS  Training their situational awareness. You're running a sales team and you need them to be worth your clients' time. No longer can a sales professional survive just delivering content. They must deliver context. To do this well they must maintain an up-to-date situational awareness. As things move so fast in the commercial environment regulatory appetite, and consumer sentiment, how does a sales team stay current? Add this drill to your weekly meetings. For the first five minutes with everyone standing you go around the group asking each sales person to offer something new to their colleagues. It is a competition for two qualities - freshness and relevance. Freshness means that the group has not heard it before. Freshness guards against old new news. "Amazon are entering our market", and pushes your sellers to scour the blogs, streams and feeds for something genuinely new. Relevance means the insight is useful for sales conversations with clients which guards against noise over signal. For kicks you can maintain a perpetual weekly trophy (the "smart arse award" for example - picture of a donkey in a photo frame) and have it passed around the team week to week for the sales person who offers the most compelling insight.